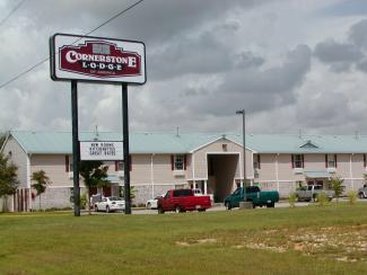 Check Rates & Availability at Cornerstone Lodge Of Foley! Cornerstone Lodge of Foley is conveniently located in Foley Alabama within minutes of the Gulf Beaches and Tanger Outlet Factory stores. When looking for the perfect blend of quality service and value Look no further than Cornerstone Lodge of Foley. So whether you are staying a night week or a month our friendly and courteous staff is here to make your stay an enjoyable one. Cancel by 3 PM local hotel time at least 24 hours prior to arrival to avoid a 1 night cancel penalty charge. RESERVATION MADE WITHOUT A VALID GUEST CONTACT PHONE NUMBER WILL NOT BE HONORED AND CANCELLED.